When private investigator Sandro Cellini is invited to attend a glamorous launch party for a luxury residence overlooking the glittering expanse of Florence, he has no idea what he's walking into. Behind the ancient and luxurious facade of Palazzo San Giorgio, there lies a series of terrible secrets; an old torture chamber, hidden for centuries in the bowels of the building, and a much more recent malevolence. The former head of security for this elite development has just died under suspicious circumstances and Sandro finds himself - quite literally - stepping into dead man's shoes. He soon discovers that other unsavoury incidents have tainted the prestigious opening. When one of the residents is found murdered in her room, events begin to spiral out of control. Sandro must work to untangle the complex web of relationships that exists between residents and staff to unmask a deadly killer. 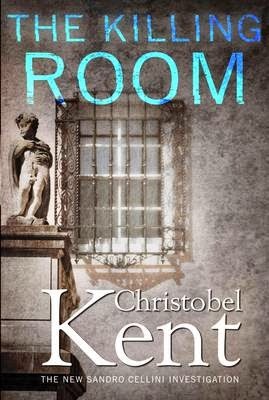 The Killing Room is by Christobel Kent and is due to be published in July 2014. Vespasian's brother, Sabinus, is captured by druids. The druids want to offer a potent sacrifice to their gods - not just one Roman Legate, but two. They know that Vespasian will come after his brother and they plan to sacrifice the siblings on mid-summer's day. But to whom will they be making this sacrifice? What were the gods of this land before the Celts came? Only the druids still hold the secret and it is one of pure malevolence. Vespasian must strive to save his brother whilst completing the conquest of the south-west of the haunted isle, before he is drawn inexorably back to Rome and the heart of Imperial politics. Claudius' three freedmen remain at the locus of power. As Messalina's time as Empress comes to a bloody end, the three freedmen each back a different mistress. But which woman will be victorious? And at what price for Vespasian?" Less than six months after taking office, the Norwegian Prime Minister is found dead. She has been shot in the head. But was it a politically motivated assassination or personal revenge? The death shakes the country to its core. The hunt for her killer is complicated, intense, and gruelling. Hanne Wilhelmsen must contain the scandal before a private tragedy becomes a public outrage, in what will become the most sensitive case of her career... This is a story of lies, intrigue, and politics. The Lion's Mouth questions who holds the power in Norway, and how far they will go to use it. The Lion’s Mouth is by Anne Holt and is due to be published in November 2014. When a group of minor celebrities are thrown a lifeline – a new reality television programme set in a notoriously haunted house – they snap the opportunity up. But as they explore the shadowy old building, uncanny things start to happen. While the camera rolls, their orchestrated fear turns into terror, as they realize not all of the happenings in the house are for effect… Night after Night is by Phil Rickman and is due to be published in October 2014.